In addition to outstanding dining, St. Augustine offers distinctive shopping, world-class entertainment and top-notch services. ENTERTAINMENT • SEE & DO! ST. AUGUSTINE’S HISTORY is, in a word, epic. As the nation’s oldest continuously occupied settlement, St. Augustine is 453 years young this fall. Its historic districts are filled with sites and architecture that tell the story of a coastal city that has hosted the hopes and dreams of many people. From the indiginous tribes, to the earliest European settlers, to wealthy industrialists and snowbirds from the late 19th century, to the foot soldiers of the Civil Rights Movement, St. Augustine is hallowed ground. And history is in the making as newcomers arrive daily to make their homes and businesses here. 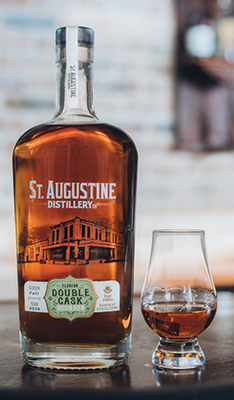 What part will you play in St. Augustine’s next chapter? FESTIVALS, HOLIDAYS AND COMMUNITY EVENTS, OH MY! HEALTH AND WELLNESS is easier when you live in a sunny, mild climate which allows for outdoor activity year-round. Have you ever practiced yoga on the beach? It’s a game changer when you do triangle pose and your drishti is upon the endless blue sky. But even in the studio, the good energy of City Wellness is palpable. This amazing yoga studio and spa on the island at SeaGrove Town Center offers a full schedule of classes as well as donation-based special events and classes, community acupuncture for reduced rates, and a full-service spa with nail services, massage and more. Alternative therapies such as massage and chiropractic medicine are also widely available in the Ancient City. Feeling great should never be a privilege; it is an imperative for enjoying the good life that St. Augustine offers. Viva! Shopping in the Oldest City is like a super-sized treasure hunt! Exploring St. Augustine’s historic neighborhoods, village-like town centers and shopping plazas is fun in and of itself because of the sunny climate and historic charm. But creative retailers, gallery owners and culinarians make “shopping local” in the Ancient City a must. You will find plenty to savor and acquire! Heavenly smells entice you into The Spice & Tea Exchange with two locations in Historic Downtown and Uptown San Marco. And tasting is a big part of the fun at The Ancient Olive on King Street, with its collection of premium olive oils, balsamic vinegars, mustards, sauces, olives and much more. ART GALLERIES offer a glimpse into the artistic soul of the Ancient City. Not surprisingly, the local art community has historic roots. Between the 1930s and 1950s, St. Augustine developed into the largest artist colony in the South, attracting hundreds of American artists. See a permanent collection of the artists who led the charge at The St. Augustine Art Association at 22 Marine Street in historic downtown. Today, the local arts community is just as vibrant. Make the rounds to enjoy show openings during St. Augustine’s monthly First Friday Artwalk from 5-9 p.m. to see for yourself! pictured top right: A spectacular selection of handblown glass is a favorite at Rembrandtz on King Street. 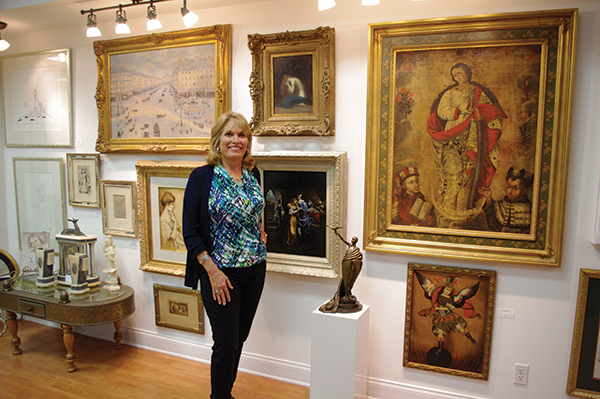 above: Find everything from old masters to modern at Victoria Golden’s Lost Art Gallery on St. George Street. right: Wearable art is just part of the dazzling collection at Amistad, a fair trade store and gallery on Charlotte Street. WORLD-CLASS ENTERTAINMENT is another benefit to life in the Ancient City. Concerts featuring international artists entertain year-round at The St. Augustine Amphitheater and Ponte Vedra Concert Hall. The Emil Maestre Music Association presents a dazzling evening concert series featuring international stars of music and the Ancient City has its own opera company and community orchestra. Limelight Theatre, St. Augustine’s acclaimed community theater, offers year-round comedies, dramas and musicals. Its Uptown San Marco location makes it a perfect dinner-and-theatre option. Limelight Theatre’s Old Mission Avenue location is the site for dazzling musicals, comedies and dramas on the main stage, live local music performances in the Black Box on Sundays and an outstanding children’s theatre program. EDUCATION BECOMES MORE FUN when adult beverages are involved! St. Augustine has three amazing wine shops—Carrera Wine Cellar in Uptown San Marco, The Gifted Cork & Gourmet on Hypolita Street downtown and Tim’s Wine Market on Anastasia Island in Seagrove Town Center—which offer wine tasting and expert advice for wine selection and purchases. Carrera Wine Cellar also offers a fun array of classes, including the popular Brushes for Lushes, led by different local artists. Downtown, San Sebastian Winery offers an outstanding educational tour and tastings, which inform your purchases at the beautiful shop. Carrera Wine Cellar on San Marco Avenue offers wine tasting classes, a comfortable wine bar where you can relax with a glass of wine and a well-stocked shop.